Daire Santos is not your average teenager. She's spent most of her life travelling alongside her mother, Jennika, who's a make-up artist on movie sets. It's nice having the opportunity to see exotic destinations, but moving constantly leaves both mother and daughter with no room for commitments; whether it be friendships or intimate relationships. And Daire has been around enough stars to not go gaga for them. She isn't fazed by their popularity. Thus leaving a few male actors to inevitably get drawn to her genuineness. You'd think that's a great life for a sixteen year old who gets to see the world. However, Daire has some issues. She's been having horrific visions for a while now, keeping it a secret from her mother following her less than encouraging reaction the first time Daire explained it to her. Unfortunately, after an evening out roaming around Morocco with pretty boy actor Vane, Daire realizes that nothing stays a secret for too long. The teen gets hysterical, almost scarring up-and-comer Vane for life, and ends up in a hospital bed bounded and written off as psychotic. Doctors urge her mother to quickly seek help within the states once they're back, but Daire holds firm to her belief that what she's seeing is real. Sadly, how can anyone believe such a thing? After all, it is only Daire who sees thousands of crows, glowing people, and severed heads. Jennika is feeling overwhelmed with everything that's happening to her daughter and has no clue whatsoever on what to do next. She's advised by doctors to admit Daire into a psychiatric hospital but she knows within her heart that her daughter's behavior is not of someone who's mental. Thinking she's exhausted all options, Jennika receives a phone call from Daire's long-lost grandmother. Paloma Santos reassures Jennika that she's their only hope in healing Daire. She takes the risk, despite not seeing the woman for almost seventeen years, and agrees to let Daire stay with her in New Mexico while she goes back to work on the next film. It all seems too coincidental that Paloma is popping up now that Daire's visions have gotten worse, since the grandmother made no connections with either after her son's funeral, which she abruptly left right after. The real journey in Daire's life starts upon arriving in New Mexico, as she becomes enlightened about the visions, why she's having them, and is even given an understanding of what's up with the crows. She also discovers her true ability and what she has to do to save not only herself but those she loves. Of course, the story would be rather unseasoned without a tad bit of romance. And Alyson delivers much of that in very heated pages. But, is this new found love the real thing, or is Dace something the enemy has conjured? Let me stop there before given away anything else. Alyson Noël has created not one, but three new lovable characters. Daire is a strong-willed individual who has the ability to take on any challenge. Her fighting spirit is reinforced by the love and support of her only family, Jennika and Paloma. Their roles in this story is far from useless, but rather significant and interesting. While Daire's mom is distant for a bit throughout the book, her devotion as a mother is still just as present. And who could possibly overlook Paloma? She's the kindest grandmother ever. Her knowledge provides closure for both Daire and me, the reader. Without this enchanting character we'd all be in the blue as to what the real meaning of everything happening is. And who can forget Dace, dude is the epitome of hot male character. Need I say more. In conclusion, the book was an enjoyable read for me. At times there were too many details when I wanted it to keep moving. And being that I'm not used to doing such a thing, I certainly didn't agree with Daire calling her mother Jennika, and even her speaking tone was that used between friends. I suppose it had something to do with Jennika giving birth at seventeen. Well, at least that's the impression Alyson gave me from the attitude of both characters. Regardless, it's a story you'll like; not only is it different, culturally in particular, it's a book you'll want for the summer. Fated is magical, intriguing, and romantic, with brilliant twists and turns to keep the spontaneity heightened. Alyson Noël is the #1 New York Times best selling, award-winning, author of FAKING 19, ART GEEKS AND PROM QUEENS, LAGUNA COVE, FLY ME TO THE MOON, KISS & BLOG, SAVING ZOË, CRUEL SUMMER, FOREVER SUMMER (a LAGUNA COVE/CRUEL SUMMER 2-in-1), the IMMORTALS series including: EVERMORE, BLUE MOON, SHADOWLAND, DARK FLAME, NIGHT STAR, and EVERLASTING, the IMMORTALS spin-off, RILEY BLOOM series including RADIANCE, SHIMMER, DREAMLAND, & WHISPER (04.26.12), with short stories appearing in the anthologies FIRST KISS (THEN TELL), KISSES FROM HELL, & DEAR BULLY. 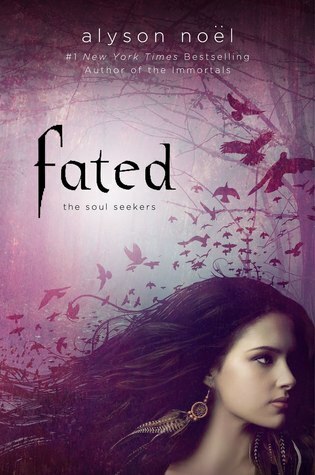 She is currently working on a new series for teens, SOUL SEEKERS, including: FATED, ECHO, MYSTIC, & HORIZON. Nice review! I'm glad you really enjoyed this one. I think I might enjoy it. I'm sure my sister would. she's big into these types of books. Never read anything by this author, though I should. Thank you! I'm sure you'll enjoy it as well. This is the first review for Fated I've read. I think I would probably like it. I liked her other series quite a lot. Thanks for sharing. Nice review, Shane! Btw, I didn't realize that I wasn't following your blog. I am now. I'll put your button up asap. Oops! Just realized you don't have a button. Lemme know if you get one up! Thanks Andrea. Yep! I almost forgot about my button. Need to make one ASAP. Thanks for the reminder! FATED is about a teenage girl discovering who she really is. Daire Santos travels around the globe with her mother who is a movie make-up artist. Strange things begin happening to Daire. She sees dead crows everywhere, time stands still, and she has extremely vivid dreams. Daire has an emotional breakdown and is sent to live with her grandmother. While at her grandmother's house, she finds out who she is and what really happened to her father. Glad you liked this book. Haven't been sure whether to bother with it myself tbh. I've read all of 'The Immortals' books by Alyson Noel and wasn't too impressed with them, they were good but not great. I'll have to check this one out.